Too Fat Lardies is pleased to announce that Dux Britanniarum is now available in basically every form you could want it in. 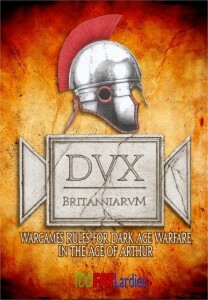 We are very pleased to announce the our wargames rules and campaign system for warfare in the Age of Arthur, Dux Britanniarum, is now fully available. The rules may be had in hard copy with the complete card set, hard copy rules only, in PDF format or in electronic tablet format designed to be fully navigable on touch-screen tablest such as the iPad. You can also get the card set on its own in hard copy or as part of a bundle with the PDF or tablet version of the rules. So, lots of choice to allow you to get the rules and cards in a format that suits you!